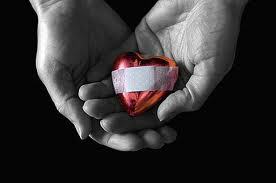 Does a Broken Heart Ever Heal? I had to ask this. I don’t know why I am down right now, but for some reason, I went through a phase tonight where all I could do mourn for a person who died to me 2 years ago…No, he’s not physically dead but he might as well be because I have no intention of letting him back into my life. I visualized putting flowers into the sea and watching them drift into the sea as I said, “Nevermore”. Yes, I know that is what the Raven said, but for some reason my heart felt very heavy tonight and it surrounded him. A friend then urged me to call him to which I replied, “What the hell for? There is no point.” Well my friend says that this guy keeps asking about me. So what? I don’t want him back. He chose to be where he is. He can stay there. I felt better the day I said goodbye to him. I will not go back ten steps when I am moving forward and my career is going well. To let him back into my life in any capacity would only set me backwards. I do not need that–not now–not ever. Had he been genuine and not leading everyone around him (including his family) with false promises and lies, it would be different.